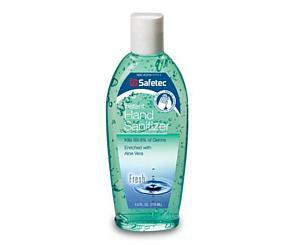 Our Instant Hand Sanitizer kills 99.99% of disease causing germs without the use of soap and water. It evaporates completely with no rinsing required. A.B.H.C." contains aloe vera to add moisture with each use, thus encouraging frequent hand sanitizing to aid in reducing the risk of cross-contamination. Use to help meet OSHA and CDC hand washing standards in the absence of soap and water.